The original Thanksgiving wasn't exactly the Pilgrim-and-Indian lovefest we collectively misremember. But despite growing recognition of the degree to which the Thanksgiving story has been rewritten, the same analysis has not been applied to the holiday's traditional foods. We still tend to cook the same dishes each year, dictated by habit more than history. The original Thanksgiving did not include turkey, pumpkin pie and other contemporary Thanksgiving staples, like women, children and football. But according to historians, it did include a lot of seafood, thanks to its location on the Massachusetts coast. Likely foods included cod, oysters and other shellfish, as well as venison. The first historical mention of turkeys at Thanksgiving was in the 1827 novel Northwood by Sarah Josepha Hale. The popularity of turkeys at Thanksgiving really took off in 1947, when the National Turkey Federation began presenting turkeys to American presidents in advance of every Thanksgiving. More recently, Tofurkey has met commercial success, allowing vegetarians and vegans to join in the modern ritual of using the turkey to celebrate what is sometimes referred to as "Genocide Appreciation Day." One part of the Thanksgiving story that is true: Afterward, the Native Americans did indeed help the Pilgrims through the winter, which the Wampanoag tribe almost immediately came to regret. During the winter that followed that first Thanksgiving, the tribe so vastly outnumbered the Pilgrims they could easily have wiped them out, forever changing the official start of the Christmas shopping season. Instead, just two years later, a Pilgrim preacher named Mather the Elder was able to thank God for smallpox, which by that point had wiped out the majority of the Wampanoag. Decades later, many of the remaining Wampanoag died in King Philip's War, which by today's standards would be considered a massacre. Compared to the holiday's historical reality, the actual food that was served at Thanksgiving is much less depressing to think about. While there was no pie, the Pilgrims might have contributed stewed pumpkin, along with boiled bread (dumplings) and cheese curd fritters. And there might have been sobaheg, a Wampanoag recipe still made today by tribal members. Sobaheg includes a trio of vegetables commonly associated with Native American farmers: corn, beans and squash — aka the Three Sisters. Sobaheg also contains some kind of meat, like venison or even turkey. 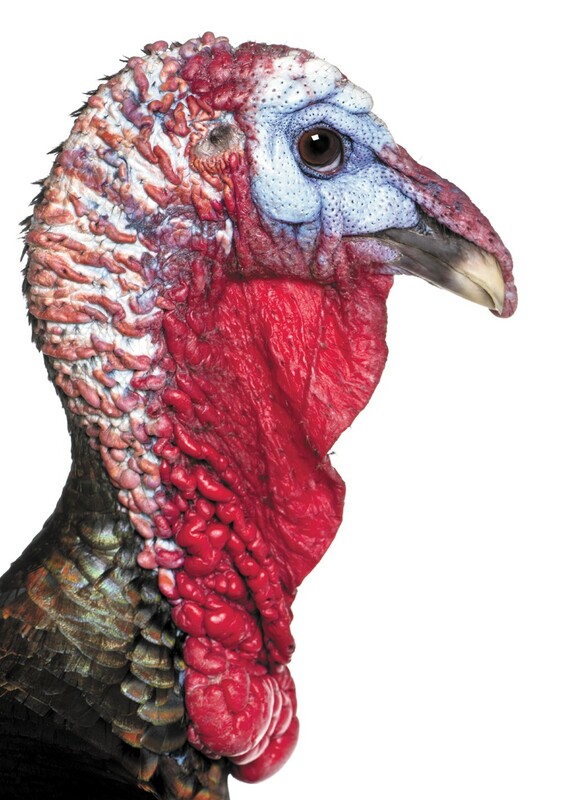 Centuries before European contact, the region's Native Americans already had domesticated turkeys. According to historians, turkey wasn't served during the original three-day bash. But if they're wrong, and turkey snuck its way onto the original Thanksgiving table, it could very well have been via sobaheg. Optional: ½ cup raw sunflower seeds, pounded to a coarse flour — or use a coffee grinder to pulverize them. This adds a unique flavor, one that some might find a little too unique. There's a lot of leeway, in terms of how mushy you like your corn, beans and squash. I like the beans soft, the squash and corn a bit more toothy. Adjust your procedure according to your tastes. Cook the beans in water until they're nearly tender. 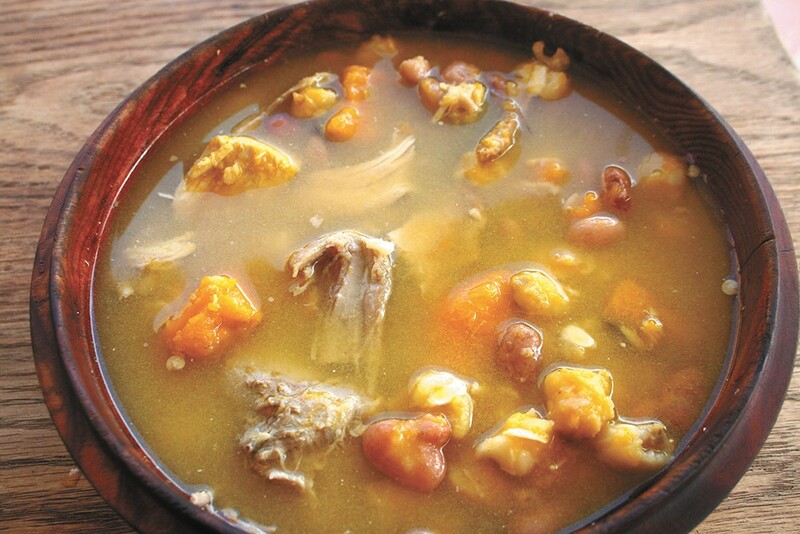 If you're using dried hominy corn — as opposed to canned or frozen — it should be cooked with the beans. While the beans are cooking, roast your turkey at 250° until it's browned. Turn the oven off and let the turkey slowly cool. When the beans are soft, change the water and adjust the heat to medium. If using frozen hominy, add it now. Add onion and garlic powders. When the turkey is cool enough to work with, pull it into pieces and add them to the pot. Let it simmer. If using canned hominy, add it now. About an hour before serving time, add the squash chunks. Adjust seasonings with salt or chicken bouillon. If using it, add sunflower seed flour and stir it in.